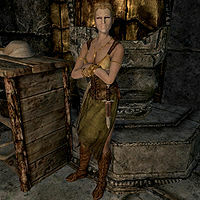 Hroki is a Nord that works in the Silver-Blood Inn in Markarth. She is the daughter of Kleppr and Frabbi and the sister of Hreinn. She spends most of her time inside the inn, occasionally going outside to the outdoor market to ask about the newest fashions. When inside the inn, she will tell you, "I'm just here to clean up." As long as her parents are still alive, she will also advise you to ignore their arguments: "Don't mind the yelling. My parents are always going at each other." She will also defend her father by saying, "My father is more generous than he lets on. Gives me plenty of spending money." Hroki wears a set of tavern clothes and a pair of boots. She is equipped with an iron dagger, and carries a selection of common items and gold as well as an additional 50 gold. She is the only adult in the game that has the "child" class, though it is more of an oddity than anything else since it doesn't actually make her a child or invulnerable as they are. Hroki is also the name of a Whiterun guard who was taken away by the dragon, Mirmulnir. This page was last modified on 24 April 2015, at 22:55.